Location is an important aspect for developing of any Site Evaluation, taking care of aspects such as accessibility, market data, points of interest, surroundings, daytime population and displacements. Knowing and understanding these variables ensures a better understanding of the area type and the market potential. The development of isochrones is the ideal technic to achieve this evaluation, iso times – similar times well known as isochrone describe with a concentric line the average access time of travel to a particular site. 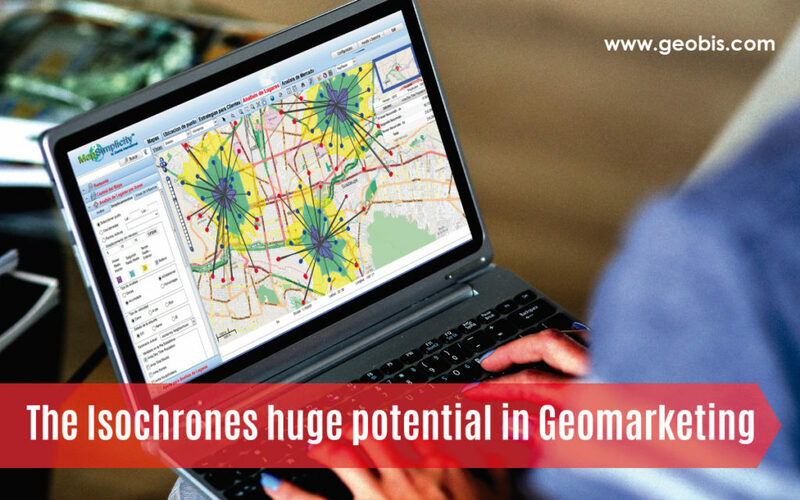 The area formed by an isochrone contains features that affect any activity, so understanding them is essential to develop GeoMarketing strategies anywhere. For example, if we want to start a business: knowing the population and how much money is invested in buying products, makes it easier to evaluate if a site is really profitable and the magnitude of its potential; other isochrones applications for site evaluation are: relocation of service points, franchise development, break-even point analysis, among others. Doing site analysis with isochrones is now as easy as clicking on the new Geobis MapSimplicity Analytics Cloud Platform, you can also select the type of displacement method: by car, by bus or by walk and the magnitude of the area with the time you want to evaluate (5, 10 or 15 minutes for example). It is typically proven that up to 70% of average income can be visualized in the first 15 isochrone minutes of a business. Therefore knowing the market potential and the socio-geographical profile by isochrones and by economic stratum, is an enormous strategic power information to support the processes of decision-making.